And you lot didn't think I could do it! Actually most of you thought I could do it, which is a scary amount of confidence that you have in someone that couldn't plan a going away party let alone a 14000km trip across Russia. My unplanned ways were most welcome in Russia, I got the feeling (mainly after my 20th vodka shot at 11:00am Wednesday morning) that most Russians couldn't give half a rats arse what happens tomorrow. I almost felt responsable. I'll update you on my week of drinking with bikers in St Petersburg later... For now I'm in Finland!!! 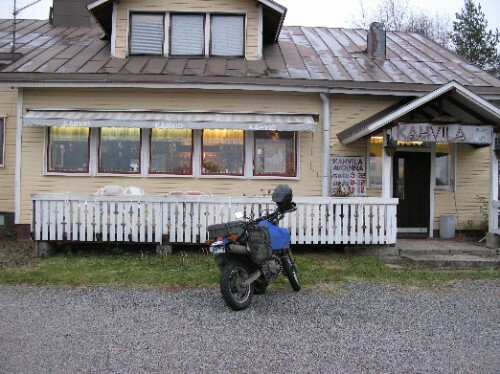 Had to cop a fine at the Russian border on the way here ($A75.00), apparently I was ment to be out of the country on the 3rd of October according to the bikes documents that I didn't/couldn't read. They made a big deal of it (of course) and I think they expected me to get pissed off or cry or something, but I just blamed myself and laughed (a lot, because I was going to Finland which is like Australia and has flushing toilets, hot running water and loads of people that speak English). I had to sign 5 different forms and write an explanation of why I broke the sacred customs laws, like at school when you do something wrong and get caught. I, of course did't mention that I had also been riding around without insurance for a couple of weeks.... And that I almost got caught, but it was only almost. A traffic cop pulled me over just outside Moscow and as I was taking off my gloves he had a phone call and must have decided it was too hard to do two things at once and waved me on. I, of course, didn't know about this other problem with my bikes documentation at the time and really think now that I might have been completely rooted if I had been caught.... more luck that I still don't beleive in! Anyway, after all the confusion on the Russian side of the border I arrived at the Finnish side where the customs officer asked where I had come from, looked a little impressed at the answer and handed back my paperwork with that "well I'm not going to stop you now" look. Amazingly easy. So it's great to be in Scandoland again, but also a bit sad to leave the lawless and crap roads of the far east, bribing the police, drinking vodka for breakfast, having nobody speak English and most of all the Russians that helped me out so much without expecting anything in return. Spaseeba Russia! Bring on the snow Finland!